Deodorant is undoubtedly one of the most difficult products to green in your routine, but it's also one of the most vital. Conventional deodorants and antiperspirant are loaded with chemicals, heavy metals, and synthetic fragrance, and lymph nodes in the armpits readily absorb and hold onto these toxins. 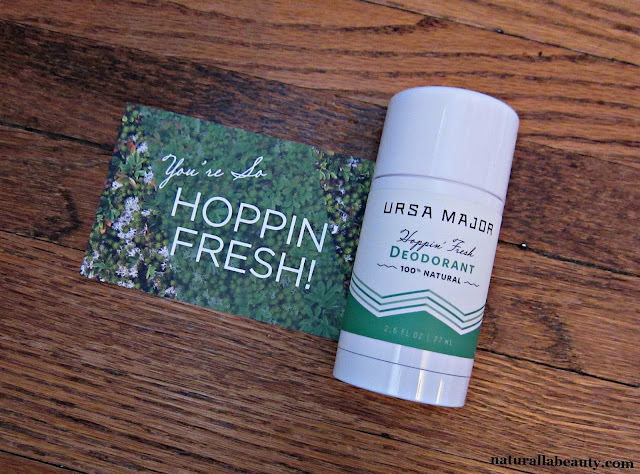 Thankfully there are plenty of healthier options out there today, including Ursa Major's new-to-the-scene Hoppin' Fresh Deodorant*. I've been using Hoppin' Fresh for upwards of a month now and I'm happy to report that it's quickly become one of my favorite deodorants. Days 1-3: The honeymoon stage. I smell fresh and clean all day and love everything about the deodorant. Days 4-8: Trouble in paradise. Odor protection starts to last only 4-5 hours before wearing off. Reapplying helps for a short time, but the deodorant wears off again in another 2-3 hours. Days 9+: Back on track. Hoppin' Fresh starts lasting again and I'm back to smelling good the entire day, sans reapplications. Which just goes to show that, even for someone who's been exclusively using natural deodorant for years, there can still be an adjustment period when switching to something new. Setting aside odor protection for a moment, the most unique thing about Hoppin' Fresh is just how comparable it is to conventional deodorant in both feel and application. The deodorant is a smooth, firm stick (not even a hint of crumbling here!) that glides on super easily. This perfect, almost gel-like consistency is pretty standard in mainstream deodorants, but it's something I haven't found in other natural ones - and goodness knows I've tried more than a few! It goes on clear, dries quickly, and won't stain clothes either. The smooth texture is courtesy of a base of soothing aloe vera juice and the often vilified propanediol. Without going off on too much of a tangent, propanediol is often linked to propylene glycol due to similarities in chemical structure, but there are some notable differences. Where PG is petrochemical-based, propanediol is mainly derived from corn sugar fermentation. Manufacturing doesn't have the same environmental impact as that of a petrochemical, nor does the end product carry the same allergy or toxicity concerns. Hoppin' Fresh isn't an antiperspirant - and really, you wouldn't want it to be! - but kaolin clay does its part absorbing moisture. I've never felt excessively wet or sweaty while using it. When it comes to odor protection, Ursa Major has you covered with a powerful trifecta of anti-microbial and anti-bacterial hops extract, baking soda, and essential oils. I know baking soda is an issue for an increasing number of people, but even if the thought has you cringing in anticipated agony, I wouldn't write this deodorant off just yet. I've had problems using "simple" baking soda formulas for the last six months or so, but I haven't experienced any irritation from Hoppin' Fresh. I've even tested it immediately after shaving without any issues. As I mentioned, it took a little over a week for the odor protection to fully level out for me, but since then, it's been top-notch. I only apply the deodorant once a day and I still find myself smelling fresh the following morning. Granted, it's winter here now, but judging by how well it holds up to a sweaty workout, I'm pretty confident Hoppin' Fresh will fare well in the warmer months too. Out of the tube and freshly applied, the deodorant smells minty and herbal thanks to a blend of plant extracts and peppermint, eucalyptus, rosemary, and grapefruit essential oils, but while the odor protection lasts, the scent wears off pretty quickly, so even if herbal scents aren't your thing, it's unlikely to bother you much or interfere with any other scents you may want to wear. Whether you're a natural deodorant pro, or you're new and struggling, I think Hoppin' Fresh is worth a try! It applies very similarly to conventional deodorant and is simultaneously gentle on the skin and offers some of the strongest odor protection I've found in a natural deodorant. I've also teamed up with Ursa Major to give one of you the chance to try Hoppin' Fresh, as well as Ursa Major's two other new releases: the Citrus Riot Body Wash and Perfect Zen Body Lotion. The giveaway is limited to US/Canada. Follow the Rafflecopter widget, below, to enter. I really like the Meow Meow Tweet baking soda free grapefruit deodorant. I am subscribed to Petit Vour monthly boxes and I recently received the Blissoma solid stick deodorant. I must say I was pretty impressed by it! The other one I received also from their monthly subscription box was the Meow Meow Tweet one. That one was also great, but I like the convenience of stick deodorants since I don't have to stick my fingers in the product. I second MMT BS-free. Also Lavanila! I've been using Schmidt's deodorant! Hoping to try out their stick formula, and other stick formulas, soon! I'm trying out Love Fresh and Routine. Routine has been working quite well. I still need to try out the Love Fresh one for a few more days at least. I love the Meow Meow Tweet Baking Soda Free Deodorant! We have begun our transition. Right now we are trying out several different natural deodorants in our household. Toms and Primal Pit Paste are two of the brands that we are using right now. I've tried to make the transition, but tend to give up after a few days of odor protection issues. Good to know I should give it a few more days to be effective! Haven't tried any natural deodorants yet and need a place to start! Yes, I use natural deodorant. My current favourite is from Riverstone Studios. I haven't yet made the switch to natural deodorant. I'm leary of it working as well as commercial products but would love to give it a try. Still on the search for the search for the perfect natural deodorant. I've tried Schmidt's which did NOT work for me at all despite all the hype. Nourish Organics is too crumbly. Meow Meow Tweet baking soda free is pretty good but when I got towards the end/bottom of the jar, it got dry and crumbly. I feel like I've tries SO MANY natural deodorants. Lately, I've got a roll on natural deodorant from Real Purity and I've been really liking it. I think it is important to use a natural deodorant, even if it takes trial and error to find the one that works for you. Yes, I use Tom's deodorant (the one with lavender). I have tried numerous natural deodorants (and DIY's) over the years, but I find my favourites are Schmidt's (especially the Lime & Bergamot scent, and Soapwalla's (just started their new Citrus deo!). So far I haven't found a single liquid roll-on that I like (i.e. usually the salt crystal types). But luckily Ursa Majors's is a solid roll-on! I do use a natural deodorant. Don't remember the brand.